Cleaning a litter box is probably the least favorite chore of any healthy cat owner. But it must be done. And it must be done regularly and thoroughly. 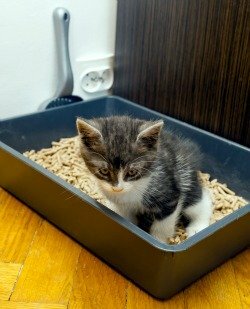 This article lists the supplies you'll need, and gives you step-by-step instructions on how to clean a litter box (the old-fashioned, not self-cleaning, kind). Cats prefer to use a clean litter box or pan. Period. If it's not up to par, don't be surprised if your kitty relieves himself elsewhere. Your kitty's litter box should be cleaned on a daily basis (at least!) with a more thorough cleaning once a week. This is especially necessary if you choose a nonclumping variety, but the best choice is definitely a good clumping litter. If you use a clumping litter, you can go longer than a week without a thorough cleaning and replacement with fresh litter, but be sure to clean out the waste on a daily basis. Cleaning a litter box will be a lot easier if you have the right supplies on hand. These are usually made out of plastic or metal, and come in different sizes. The shovels have slots so you can lift out the waste and allow the unused litter to remain in the box. I use a metal shovel, (I call it a "pooper scooper") as the plastic ones I've used tended to break too easily. It's best if you can find one with squared corners at the end, rather than rounded edges; this makes it easier to clean the corners of the litter pans or boxes. After you remove the used litter, you should top off the litter box as needed with fresh litter. Try to keep the level at about two inches. For daily cleanings, it's helpful to have a waste receptacle of some sort close by the box. That way you can put the soiled litter and feces into the container. You could use a small, covered trash can lined with a plastic bag, or you can use zip lock bags and dispose of them when they're full. You can also get a fancier litter disposal system to keep the soiled litter relatively odor-free while it's still in your home. Note: Rarely is putting the soiled litter in your toilet a good idea. Even so-called "flushable" litter can cause plumbing problems, and it usually sticks to the bottom of the toilet bowl. This is helpful for keeping the area around your kitty box clean, and it helps to keep your feline friend from tracking the litter throughout your home. You could also use a small hand-held vacuum. Some types of litter stick to the sides of the box when wet. Use a metal paint scraper to clean the sides of the box. If you have a good strong metal shovel with squared edges, you won't need a paint scraper. You'll want to keep the area tidy. Put the pooper scooper, whisk broom, dust pan, etc. in a container of some sort and store it next to, or very close to, your kitty’s "toilet." I use an old shoebox to keep all my small supplies in one place. Having all these supplies handy and nearby will help make the daily task of cleaning a litter box much easier for you. Have enough on hand to replace all of the old litter. Any type of all-purpose cleaner will work. You can even use laundry or dish soap in a pinch. Avoid anything with a strong scent; your kitty may not like the smell left behind and may refuse to use the box. The hotter the better for cleaning a litter box. Keep a separate cleaning sponge or brush for this task. This helps you to tolerate hotter water and protects your delicate hands, but it also protects you from things that sometimes come with your kitty's waste (e.g., worms). You'll need some place to get rid of all the old litter. You could use a paper bag, then take it out to your outside trash receptacle. Although it's a lot more environmentally-friendly to have a separate reusable cloth or towel to dry the litter box, I often use paper towels. To speed up the job, I often use a blow dryer to dry the box more thoroughly. Depending on the size of the box, a quarter of a cup or so of white vinegar added to the hot soapy water will help reduce smells that may linger behind in the plastic litter pan. You'll need to be careful that the vinegar smell that may remain behind doesn't discourage your kitty from using the box. 1. Remove the soiled litter and solid waste from your kitty's litter pan using the metal shovel. Do this daily, preferably twice a day. 2. Put the waste in a sealed container to prevent odor. 3. Add some fresh kitty litter to replace what you've removed. This helps keep the box clean longer. If there isn't enough clean litter, then your kitty may end up breaking up the used litter and spreading it around the box. This makes it harder for you to keep clean, and you'll end up having to do a thorough cleaning more often to prevent odor and to keep your kitty happy. 1. Throw out all the old litter. You may need to scrape the sides to get rid of some dried-on stuff. 2. Wash the litter pan with a sponge or brush and unscented soap and hot water; add a little vinegar (this helps get rid of odor, but if it seems that your cat doesn't like the vinegar odor, then don't use it!). Don't use a disinfectant. Most cats don't like the smell and may not want to use the box if it has this strong smell. 3. Rinse and dry the box thoroughly (you don't want the new stuff to stick to the wet sides or bottom of the pan). 4. Fill the pan/box with about two inches, or more, of fresh litter. Your kitty should be fine without a box for the little while it takes you to clean a litter box, but if you have two or more boxes, do them one at a time so that your kitty still has one if needed. If you follow the above cat litter box cleaning routine, your kitty should be happy and should be using the box. But if you keep it clean, and your kitty usually uses the box, and all of a sudden stops using it, this is a possible sign that there may be some sort of health problem going on. If for some unknown reason, your kitty starts eliminating in inappropriate areas, consult your trusted veterinarian to make sure you feline friend is healthy. See my Cat Litter Box Essentials article for more information.